"Welcome to Guillermo del Toro's imagination. The Mexican filmmaker known for "Pan's Labyrinth" and "Hellboy" keeps his collection of books, gory props and mannequins where he can see — and be inspired by — them. 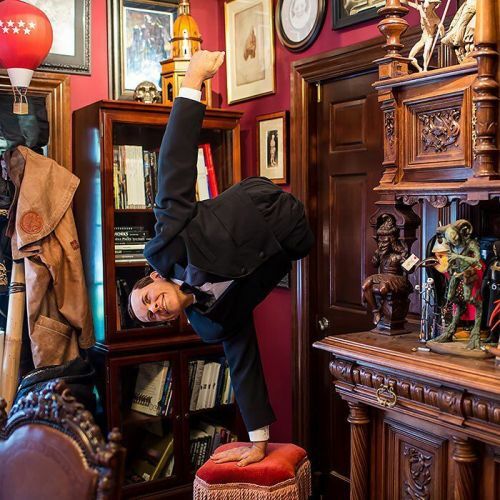 @malmeidapix took photos inside "Bleak House," as Guillermo christened his pad. Among other eclectic pieces of artwork, she photographed Johnny Eck, shown here, a sideshow performer born without his lower body from the 1932 film "Freaks." "He was quite a handsome guy," said #GuillermodelToro, who actually lives with his family nearby, in an un-Frankensteined home." By nytimes on Instagram.